Brandon Lloyd took a trip to the Lyndon B. Johnson Space Center when he was in middle school and says that he fell in love with human space flight then. He selected Illinois Tech because it was a small school that offered an aerospace engineering degree. Now an average day for Lloyd involves ensuring that there’s enough potable water for the ISS crew and an exciting day investigating space fires. 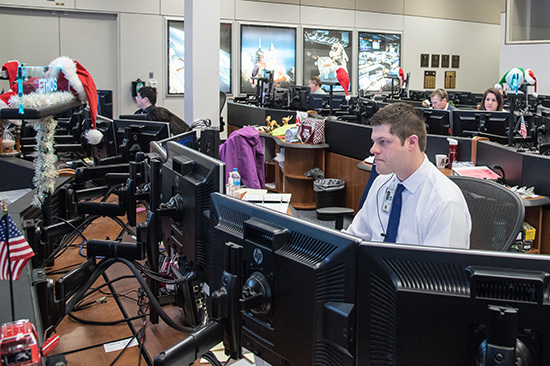 What does an ISS flight controller do? For anyone who has seen the movie Apollo 13, we’re the guys with the skinny black ties. We look at the real-time data and discern if there are any issues with our systems, have the crew respond accordingly, or respond ourselves if we can. I’m a systems flight controller, and my console position is called ETHOS: Environmental and Thermal Operating Systems. I’m in charge of the life-support systems. 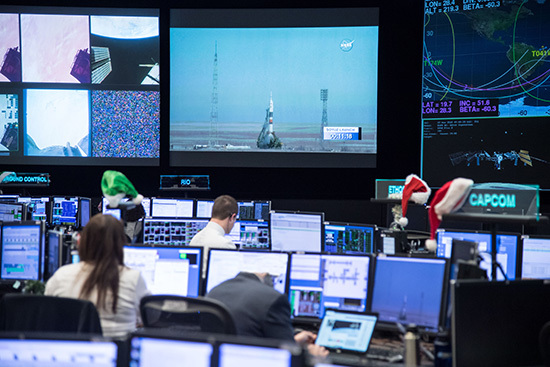 Is that something that has evolved over time to be more the purview of flight controllers, where it used to be the astronauts themselves doing that kind of work? Very much. The ISS is one of the first vehicles like it, where a lot of the automation is taken care of from the ground. With the [space] shuttle, for example, or the Apollo capsules, there were a lot of manual switches. You had Mission Control supporting the crew, looking at what the data was telling them but their response was always, ‘We need you to go flip these six switches’ or ‘We need you to go run this procedure.’ Now I can do hours of commanding from the ground, changing systems onboard, without having to bother the crew. When you do interact with the crew, what sort of interactions are you having? How many crew members are you monitoring at a given time? Typically, six. There are periods when there are only three, depending on how the vehicles go up and down. That’s going to change soon; we are getting astronauts from American soil for the first time since the shuttle was retired. That will be exciting and will increase our number of crew members to seven. We spend a lot of time on water balance: We’re turning yesterday’s coffee into tomorrow’s coffee. We’re looking at the rate at which we’re collecting sweat out of the atmosphere, the rate at which the crew is drinking water, and the number of times they’re using the bathroom. We extrapolate all of those inputs to see how full or how empty our tanks are going to get within the next few days. We also take the carbon dioxide that the crew breathes and perform a Sabatier process, recombining the CO2 with the hydrogen that the oxygen generator makes to recover more water. The waste product of the Sabatier process is methane, and NASA is currently investigating more closed-loop technologies such as one that splits methane to give us more hydrogen to combine with CO2—and even more water recovery. How about an exciting day? It’s the middle of the night. Six people in the whole world are watching the U.S. Segment Systems [on the ISS], and a manual fire alarm hits the board. A few minutes later the crew calls down, saying, ‘There’s white haze all across the Russian Segment. We can’t tell where the smoke is coming from.’ Ventilation automatically kicks on 30 minutes after there has been a fire alarm. On this day it took us 27 minutes to figure out what the source was, so we were just in the nick of time to get eyes on it. Is running the ISS a fairly delicate operation? In some ways, yes, but usually against mission success. There is redundancy upon redundancy for crew safety and even for vehicle survival, so seldom are we a failure away from losing the space station or having to send the crew home. As far as trying to accomplish the mission goals that day, we pack their schedule so tight and if a little thing goes wrong, you’re on razor’s edge trying to get that experiment done that day or trying to get the operation that was planned done that day. What advice would you have for a young person who would be interested in working for NASA or on the ISS? Find an internship or a co-op for NASA or its contractors or for the commercial space flight industry, which is booming right now. There are lots of companies that are supporting NASA missions directly or doing things in the area of space tourism. I found that the best way in the door is to get an internship or a co-op and just work as hard as you can during that tour. Do you have any thoughts on the commercial space race that seems to be developing and where we might be going in the future of space travel? It’s interesting that you use the words “space race.” There’s definitely some competition to it, and I think that’s a good driver. From my perspective working for NASA, it is a lot of cooperation and trying to get all of these companies off the ground. I’m the ISS life support lead for the Boeing CST-100 Starliner vehicle that’s coming, so it’s definitely been a privilege to work with Boeing. Ironically, NASA is a kind of subcontractor for Boeing. We do flight operations for [the company], so the same guys that flew the shuttle now are contributing to the design of this vehicle and its operations. Why should we explore the cosmos? We are, as humans, explorers. Our job at NASA is to figure out how we get off of Spaceship Earth, because it’s not going to be around forever. We need to know what it’s like out there and how to get there, and we’re building the initial steps for humanity to do that in the future right now. The Martian. There is a lot of realistic life support problem solving that goes on, not to mention the Andy Weir brilliance and Matt Damon entertainment value.